Is Momo stock looking cheap after recent selloffs? Shares of Momo (NASDAQ:MOMO) dipped 23.4% in October, according to data provided by S&P Global Market Intelligence. The video-streaming social-media company saw its stock sell off with the Chinese tech sector and the broader market last month, but there was little in the way of company-specific news behind the stock decline. Momo stock is down roughly 35% from its lifetime high, but it's proven resilient amid Chinese tech industry sell-offs. 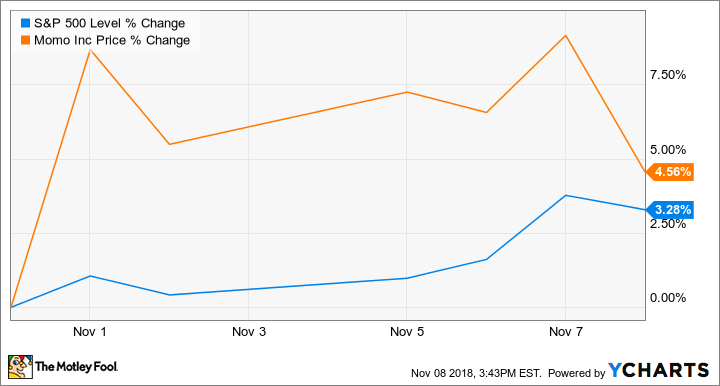 Even though the Invesco China Technology ETF (which Momo stock is a component of) has seen its price decline roughly 30% year to date, Momo is up roughly 44% on the year thanks to strong earnings growth. Momo has been posting strong growth driven by the expansion of its platform's total and paying user bases. The company's June quarter saw the business increase sales 58% year over year to reach $494.3 million and net income roughly 94% to reach $117.8 million. With that kind of growth, Momo stock looks cheap trading at roughly 14 times this year's earnings and 3.5 times expected sales. Looking ahead to 2019, the average analyst estimate calls for earnings per share to expand 26% -- indicative of some slowdown but still another sign that shares could be cheap at current prices. However, the Chinese government appears to be moving forward with stricter standards for social media and video streaming platforms, which could put the company on the hook for hiring more staff to enforce content standards in order to avoid having the platform shut down. There are also concerns about whether Momo will be able to continue expanding its paying user base amid growth for competing services. 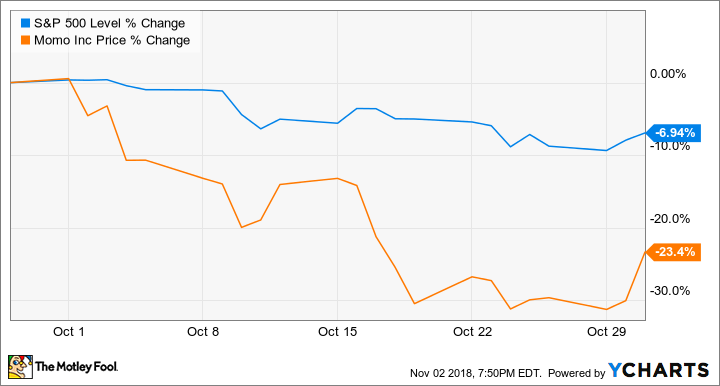 Momo stock has climbed roughly 4.6% in November so far, corresponding with gains for the broader market and an improved outlook for a trade deal between the U.S. and China. The company will likely report third-quarter earnings late in November or early in December, and it's guiding for sales of between $525 million and $540 million, representing 53% growth compared to the prior-year period. Momo might not be the low-risk growth play that its price-to-earnings and price-to-sales ratios imply, but for investors willing to embrace some of the uncertainty associated with the Chinese tech sector and the social media industry, the stock has the potential to be a big winner.